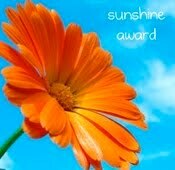 for giving me this Sunshine Award for both this blog and my Choosing to Grow-Through Marriage blog. I think in my heart of hearts that writing, and moving others through writing, is what I want to do with my life. I don’t know how that is all going to come together, but I trust that it will, and when I am recognized by another gifted and talented woman, it inspires me to keep working. There is something amazingly powerful about the internet, and the beauty that women spread because of it is truly awe-inspiring. It is only right to continue moving forward with a heart full of gratitude. Thanks so much for the award, Meagan! I popped over to thank you but then got caught up in reading your other posts. ;o) Keep up the great writing work! HI Megan! Thank you for being #50! You can use your extra entry on my Shushybye giveaway which ends tonight or on the Fabulous 50 Giveaway I'll start later this week. Thanks again and I'm following you too!